There are several kinds of the benefits or the grants which are awarded to the students, who can’t fund their fee to study in the particular educational institutions, such as the scholarship, fee grants and other such benefits. A bursary is one of those benefits or the grants, which is awarded by an educational institution to those students who are unable to fund their studies. The bursary grant is awarded by the different-different organizations such as the educational University, companies or even the government agencies. This grant can also be awarded to a working individual who wants to proceed further with his/her studies, and thus the bursary can be granted by the employee organization to such an individual. Generally, an individual who is making an application for the bursary grant to the concerned commission is also required to address the motivational letter along with the application. In this letter that individual puts the extra information as to what has motivated the individual to pursue the further studies, and why should the particular commission or organisation be looking forward to granting that individual with the bursary grant. So, if you are looking forward to writing the bursary motivational letter for the sake of bursary then keep reading our entire article. We would provide you with some basic tips and step by step guide, which will help you in writing this bursary letter to the concerned commission which can provide you with this grant. In this part, you need to address or greet the bursary commission in your letter. If you have the complete address and the name of the person in charge, then address the letter with the same information else you can write it using the standard information. 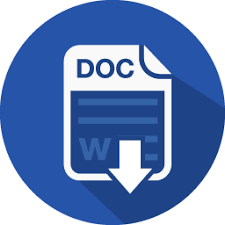 Now provide some basic information about you as to who you are and your educational qualifications, and then state the objective of this motivational letter in the clear and straightforward words. Keep in your mind that you don’t need to overwrite or reiterate the purpose of the letter over and over again. You need to be formal in your language but the confidence must also be reflecting from your language, as to what you are asking for in this letter. Now in this part, you need to be first providing your educational backgrounds in a way, that it can be understandable to the other person as to what you have studied in your past and what you are capable of next. Now firmly and gently explain your further ambition of the studies and what you are planning to achieve next in life. If you are a working person and making your application for the bursary in the course of your employment, then you can state the reasons as to how your further studies are going to make you more competent in your work which will benefit your employment organization as well. You can attach the documents proof of your academics excellence in the letter with a view that, if you are granted with the bursary then you are going to be proven as the worthy candidate for this bursary reward. This is the last and the finishing part of the letter and hence you are going to draft it in a similar manner. 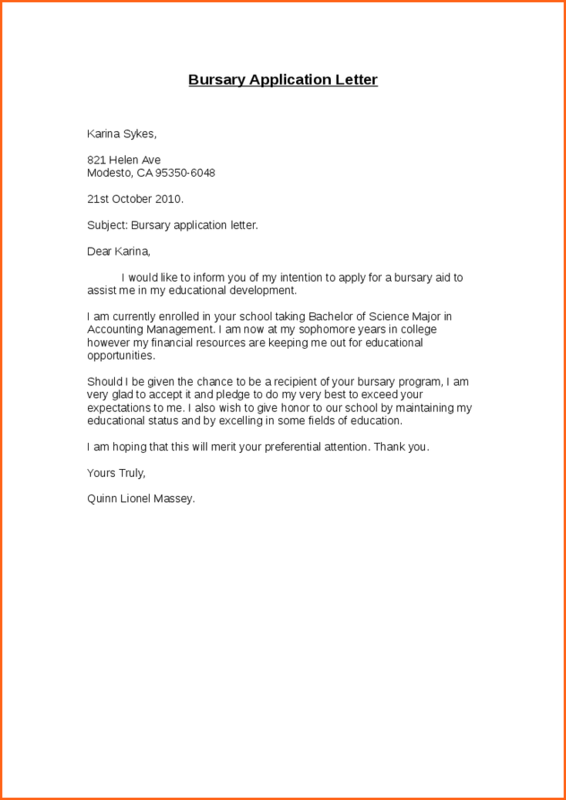 In the last part of the letter you can summarise your whole letter, and focus on your words that you understand the relevance of the bursary grant on the serious notes, and you know that you are going to make the most of this particular grant. State that you would be forever grateful if you are granted this bursary grant from the commission, and then just end the letter with your regards to the bursary commission. As our further suggestion, we would like to advise you that do not make this motivational letter unnecessary lengthy. You just need to stick to the point of convincing the bursary commission that you are the right person for this grant in all the manners, and you need to do that using the least amount of words. 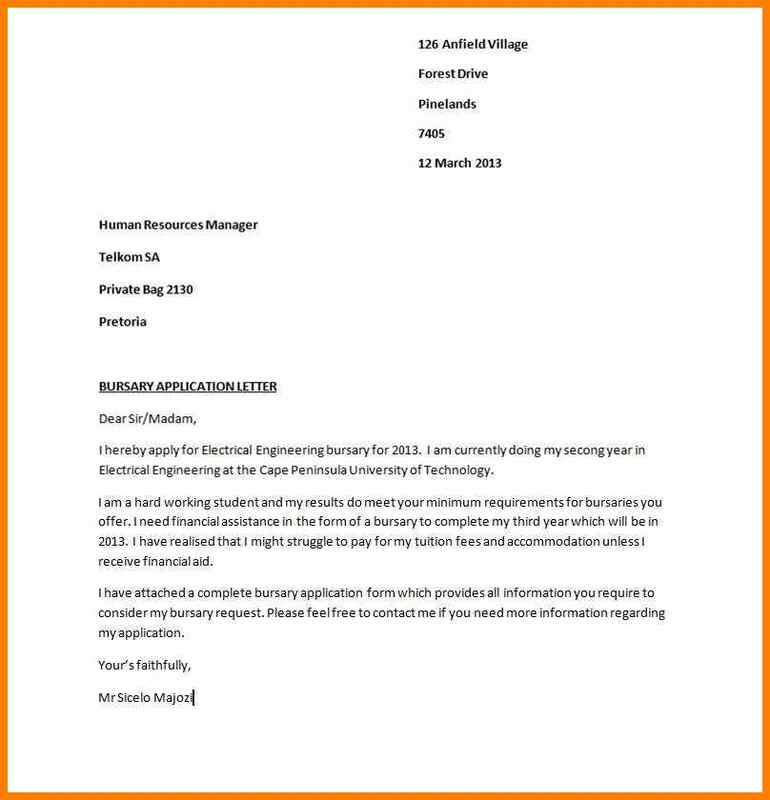 This letter can be attached with your prime application of the bursary grant and then just address it to the concerned commission.